Like a mighty phoenix rising from the ashes, the economy in the Metro Detroit area has made an incredible recovery in the past decade or so, since its well-publicized struggles. In turn, this has helped to raise up the wider economy of Michigan as a whole too. In fact, in a study published in late 2018, it was predicted that the Michigan economy would soon achieve its longest sustained period of growth since the Second World War. This is obviously wonderful news all-round… but, for business owners and entrepreneurs alike, it might actually prove to be a double-edged sword! After all, when there’s more money circulating around the state, that means there are more and more businesses springing up in places like Bloomfield Hills, West Bloomfield, Birmingham and Rochester. In turn, that means a whole lot of extra competition when you specifically are trying to get a breakthrough for your particular business. Naturally, in a competitive and crowded scene like this, it can be hard to get noticed. To do so, you need an edge. In this article, we’d like to talk to you about one way to achieve this which you almost certainly didn’t think of before – good old-fashioned window cleaning. 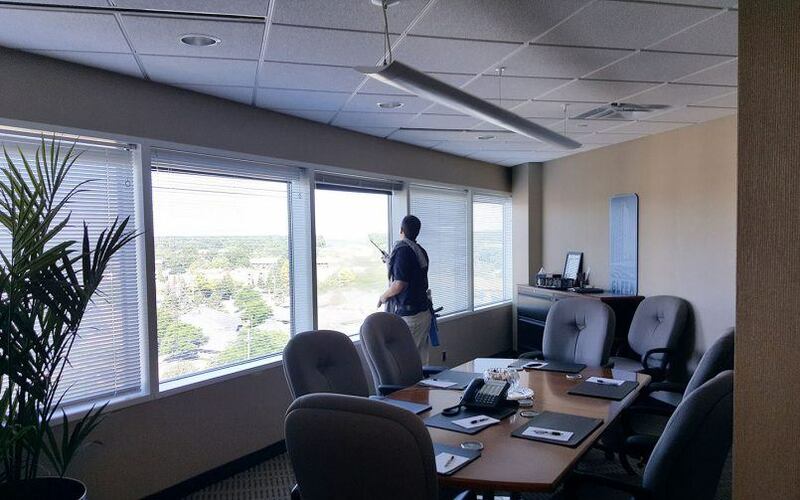 Commercial window cleaning might not be the exciting jolt that you had in mind for your business… but it’s a service we’ve carried out innumerable times here at J&M Window Cleaning – for clients all across Birmingham, Bloomfield Hills, Rochester and West Bloomfield – and we can assure you that it really does work! One of the most fundamental rules of business is that appearances matter, and this applies to the smaller details just as much as it does to the bigger, more obvious things. If you don’t look after those details, you’re just wasting your time, effort and money on the other stuff. Let’s say you’re running a café, for example, and your revenues are declining. You spend countless hours, and thousands of dollars, on branding, a new website, an interior decorator, researching and putting together an exciting new menu, and so on. That’s all well and good… but if you then forget something as fundamental as your windows, you might as well not have bothered! Within a matter of months, those windows will have picked up a layer of grime which will be noticeable to everyone who visits, even if you didn’t detect it. In turn, this will project an air of dirtiness, and a lack of hygiene, which will dissuade first-time visitors and regular customers alike from coming to your café. This is an extremely common mistake to make, but fortunately it’s also an easy one to avoid. By hiring a professional commercial window cleaning company like J&M Window Cleaning, and booking them in for regular cleaning sessions, you’re giving your business a massive edge over your competitors who do neglect the basic details. Accordingly, in the long run, this minor outlay on commercial window cleaning will pay for itself many times over. To enquire about commercial window cleaning for your business today, simply get in touch with J&M Window Cleaning – your number one option in Rochester, West Bloomfield, Bloomfield Hills and Birmingham. To do so, you can send us an email at CleanWindows@JMWindowCleaning.com, or call us on (248) 605-2243.